Are you an avid reader? Or maybe you just enjoy curling up with a book on the rainy days. 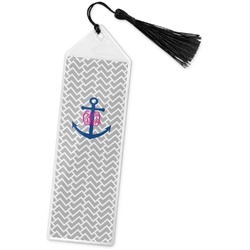 Either way this fun book mark is the perfect way to keep your place and put a smile on your face. These book marks are approximately 7.5" x 2.25". They are made of a sturdy clear vinyl with a personalized vinyl insert. The insert is double sides for double the fun! 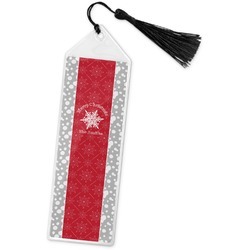 The top of each of these book marks ends in a triangle with a hole for a black fringe tassel that hangs off of it. These are the perfect gifts to give as a thinking of you present. They even work well as handouts for businesses. Start off in our design center with this product and discover our thousands of backgrounds to choose from. Create a fabulous design with a ribbon, font, background, label, and more all chosen by you! If you ever need any assistance with our design center, just give us a call. We are always happy to help you explore. Make it a gift set and get one of our spiral or hardbound journals!